Owned & operated by Tom Butler & Andrea Hunter & their daughter Erica. 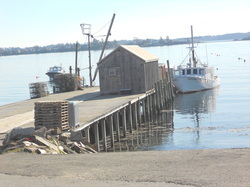 We are located on Basin Point in Harpswell, Maine, overlooking Casco Bay. We provide live lobsters year round for purchase retail or wholesale, fresh Maine scallops in the winter and a full menu at our takeout stand Mother's Day thru Columbus Day, with outdoor seating.